So your thinking you need a toke on a cigar once in a while while attending your whisky club. They say cigars go well with Single Malts (and whisky in general) but does it really? In the past when I have had the hankering for a cigar the end result is generally destruction of the sense, a dry mouth, clothes stink and feeling a bit crook a few days after. Maybe it is time to try the 'aromatically enhanced' Maker's Mark Cigar then and see what comes of it. I love the smell of a cigar and I do find the smell goes awesome with whisky but to put the cigar taint on the pallet just ruins it for me. An automatic cigar puffer on the table sounds like a good idea to me. Funnily enough you will not find this listed on the Maker's Mark site or Gift Shop site. Good enough to brand and but not good enough to endorse on the official sites. Maybe this is due to the stigma associated with the health risks? Well you cannot argue with that but I think if your going to make it you might as well sell it. I am curious id the wax is dipped at Marker's Mark as I have seen in the past they are harshly dedicated to protection of the brand and how it is applied. Even though we cannot get the 'official' word from a Maker's Mark site the next best thing is one of the online distributor's that is branding the product in their online stores. Below is the extract I have lifted from the Ted's Cigars website (It looks official enough). The Maker's Mark cigar is the perfect combination of fine ingredients and a unique smoking experience. The long-leaf tobacco is grown in the Dominican Republic, and the bourbon is distilled from red wheat in the Kentucky countryside. Together they create a cigar like no other. The unique process whereby the cigar is aromatically enhanced by Maker's Mark Bourbon makes the Maker's Mark Cigar unique in the industry. You won't find any artificial ingredients in this cigar. In fact, the bourbon never even touches the tobacco! The result is a premium cigar with all of the benefits of a premium bourbon. The perfect combination for a relaxing smoke. To top it off, each cigar is sealed in a glass tube, and then each tube is hand-dipped in Maker's Mark's signature red wax, just like the actual bourbon. An added benefit to this process is that the cigar is housed in an air-tight container. Once it's dipped, it doesn't require humidification, making it ideal for travel, the golf course, or any excursion where a humidor isn't available. So what is 'aromatically enhanced' anyway? As stated above the tobacco leaf does not come in contact with the bourbon. Interesting none-the-less I would love to find out more. Anyone with a bit of knowledge please let me know. 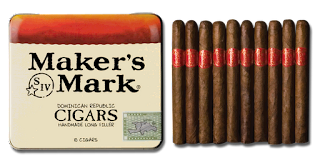 As listed the cigars come in 5 varieties: Maker's Mark 650 Toro, Maker's Mark 562 Torpedo, Maker's Mark 538, Petit Corona, Maker's Mark 10th Anniversary, Maker's Mark Cigarillos. For a single cigar as quoted from the Ted's Cigar site is around $8 to $12 US but then there is a wide variety of packs also available so better of checking this out for yourself at the Ted's Cigar store. It would seem though this is not a new idea and even looking at the Maker's Mark 10th Anniversary celebrating 10 years of the cigar is proof enough (can't say I have seen it here in Aus but then I am infrequent to a cigar store to begin with and we are a long way away). Also just even perusing the other things at Ted's Cigars it is easy to see other distillers have the same idea: Grand Marnier, Hopz, Rhum, Dumante, Forty Creek. 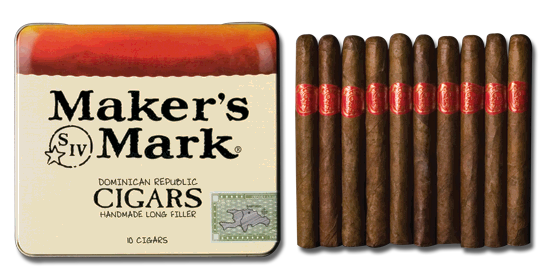 So for those in the club and visitors in the mood for a cigar why not try an 'aromatically enhanced' Maker's Mark cigar. Thanks to Ted's Cigars for the information and images.